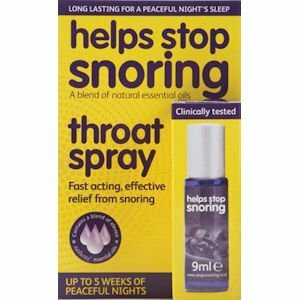 Help Stop Snoring Spray has a unique blend of natural essential oils that get to work immediately and has been clinically proven to help reduce or eliminate snoring for 4 out of 5 users. Snoring is the sound that occurs when the soft tissues at the back of the throat collapse and vibrate when we breathe during sleep. Helps Stop Snoring works by lubricating and toning these tissues thereby reducing the vibrations that can cause snoring. The essential oil blend also helps to freshen breath. Contains a blend of eleven natural essential oils. Long lasting for a peaceful night's sleep. Fast acting, effective relief from snoring. Up to 5 weeks' of peaceful nights. Apply nightly after brushing your teeth. Tilt your head backwards and spray 3 times to the back of the throat. Spray up to 3 more times if required. For best results do not eat and drink after use. If you are pregnant, suffer from epilepsy or allergies or are using medicines, please consult your doctor before use. Helps Stop Snoring is not a cure for Sleep Apnoea - seek medical advice if symptoms occur. Aqua Polysorbate 20 Mentha Piperita (Peppermint) Leaf Oil Citrus Medica Limonum (Lemon) Peel Oil Eugenia Caryophyllus (Clove) Leaf Oil Pinus Sylvestris Leaf (Pine Needle) Oil Salvia Officinalis (Sage) Oil Eucalyptus Globulus (Eucalyptus) Oil Thymus Vulgaris (Thyme) Oil Melissa Officinalis (Lemon Balm) Leaf Oil Lavandula Angustifolia (Lavender) Flower Oil Pistacia Lentiscus (Mastic) Gum Oil Foeniculum Vulgare (Fennel) Oil Citric Acid Sucralose.